Ariana brought her Nonna on stage, Cardi had a message for the doubters, Logic united immigrant families and Millie Bobby Brown was the life and soul of the party. The MTV VMAs were as star-studded as ever, and with so many talents and egos in the room, there were some attention-grabbing moments. Thanks to the Ariana Grande song, we all know by now that God Is A Woman. And her performance of that song gave us one of the performances of the night. It started with Ariana and a cast of female dancers - including a black female bikini-wearing Jesus - sitting at a long table, evoking The Last Supper, Leonardo Da Vinci's painting of Jesus and his disciples. And it finished with Ariana's beloved Nonna, her mother Joan and cousin Lani joining her on stage, hand-in-hand in a show of female unity. That wasn't the only moment where Ariana got people talking. When Nicki Minaj walked up the steps to collect the award for best hip-hop, it was Ariana who stepped out from her front-row seat to save the rapper from tripping on her (see-through) dress. Eagle-eyed fans spotted something else. Beforehand, on the pink carpet, Grande was loved-up with fiance Pete Davidson, who was wearing a home-made bead bracelet bearing the initials AGD - Ariana Grande Davidson. Aww. In her intro to the show, co-host Tiffany Haddish managed to mangle Camila Cabello's name ("Y'all know I can't read that good - I only speak English") before going on to diss Camila's former Fifth Harmony sisters. "She's nominated for five VMAs tonight," the actress and comedian said. "I'm super proud of her. So those of you watching at home... Hi Fifth Harmony!" Cut to Camila furiously shaking her head to make sure the world knew she didn't approve. But Nicki Minaj was there for the girl group. After safely navigating the steps to collect her hip-hop award - and after she gave us a view through her dress - she ticked off Tiffany: "Don't be coming for Fifth Harmony." 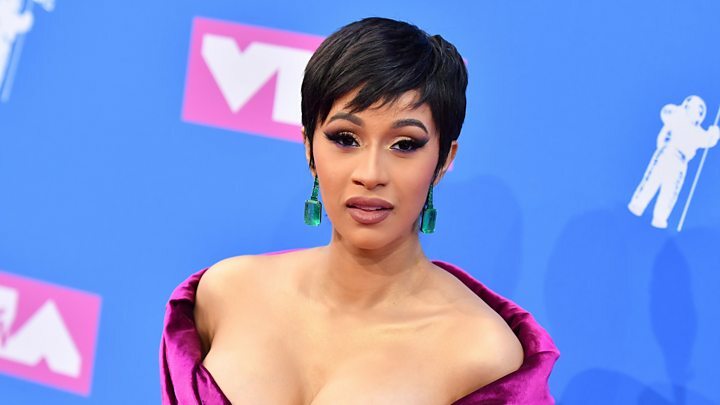 Cardi B had been expected to give her first performance since giving birth last month, but she didn't perform in the end. Instead, she opened the show - unveiling a newly cropped hairstyle - and pretended to breastfeed on stage, holding a bundle of blankets to her chest as she gave a short introduction. Given this ceremony's history of shock, a superstar breastfeeding at an award ceremony would have been truly radical. But Cardi unfurled the blankets to reveal one of the VMA trophies. She later won best new artist and used her acceptance speech to say: "A couple of months ago a lot of people were saying you're gambling your career, you're about to have a baby, what are you doing? And, you know, I had a baby, I carried a baby, and now I'm still winning awards. "All the love that my fans, that my friends, that everybody shows me, is genuine, is beautiful, and that's something that God gave me that you can't buy." Lots of people have taken that last line as a barb at the expense of Nicki Minaj, who recently gave an interview talking about record labels paying for hits. The rapper led dozens of immigrant children and teenagers wearing "We are all human beings" through the Radio City Music Hall foyer, down the aisles and onto the stage for a performance of his song One Day with Ryan Tedder. A "US border patrol" backdrop lifted halfway through to reveal the kids' siblings and parents, and the families were then reunited. It wasn't hard to decipher the symbolism. A press release said Logic's message was "to protest the Trump Administration's cruel and inhumane family separation policy that tore thousands of children from their parents and continues to keep hundreds apart". Another highlight was Jennifer Lopez's performance of a medley of her greatest hits, including Jenny From The Block, Love Don't Cost A Thing and All I Have. She also brought out the rapper Ja Rule to perform their 2001 hit I'm Real. She was then presented with MTV's annual Vanguard Award, named after Michael Jackson. During her acceptance speech, she turned to her 10-year-old twins, Maximilian David and Emme Maribel, and said they gave her strength to improve. "The future is even brighter," she said. She was also watched on lovingly by boyfriend, baseball star Alex "A-Rod" Rodriguez. The person having the most fun wasn't one of the winners. Millie Bobby Brown presented Cardi B with the best new artist trophy. ...as well as double award winner Camila Cabello.